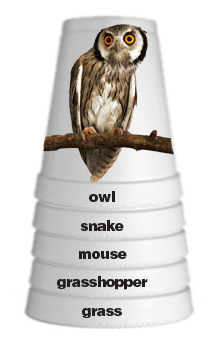 Awesome idea from Earth Mama's World: Food Chain game out of styrofoam cups! Just glue images on to your cups and write the name of the organism on the rim. Mix them up, have kids put them in order, and stack them! If you have older students, and are working with more complex wood webs, have kids stack cups in a pyramid shape, rather than nested. It's so original . Thanks for marvelous idea. Awesome! I'll be using this with my science classes next year! I plan to use this for my special ed science classes this year, as well! I going to use this in my homeschool! Great idea!